Pregnant women facing depression may also face the dilemma of whether or not to treat the depression with antidepressants. Untreated depression during or after pregnancy has been linked to an increase in poor outcomes in both mother and child. However, depression in pregnancy often goes untreated because of concerns about potential negative effects of antidepressant medications on the fetus. 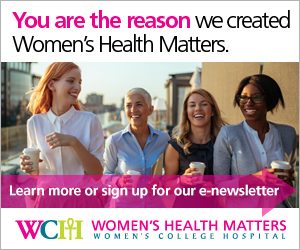 Dr. Lori Ross, senior scientist at the Centre for Addiction and Mental Health (CAMH) and adjunct scientist at Women’s College Research Institute, conducted a study to determine if there is a correlation between taking antidepressants while pregnant and negative birth outcomes. The project was led by Dr. Sophie Grigoriadis and Dr. Ross during the time that they were the academic co-leaders of the Reproductive Life Stages program at Women’s College Hospital. Based on the needs and interests of the Reproductive Life Stages program, they decided to do a project in which they could synthesize all of the available evidence about the risks and benefits of antidepressant medication during pregnancy. The study has produced several research papers: one published online in JAMA Psychiatry on Feb. 27, 2013, and a series of papers published in the April 2013 issue of the Journal of Clinical Psychiatry. “The idea was that we wanted to provide women and their health-care providers with all the evidence they needed to make the best possible decisions about whether or not to use antidepressants during pregnancy,” says Dr. Ross. According to background information provided in the study, depression is common during pregnancy, affecting about 13 per cent of women in their second trimester and about 12 per cent of those in their third trimester. The study was done through a series of literature searches that looked at outcomes that might be affected by exposure to antidepressant medications during pregnancy. What they found in the study recently reported in JAMA Psychiatry was that for most of the outcomes they were looking for, such as gestational age at birth, birth weight and Apgar scores, there were statistically significant differences between women who took antidepressants and those who didn’t. However, the differences were small, and the results for women who took antidepressants were still within the normal range. One example is birth weight. Babies with moms who took antidepressant medications had statistically significantly lower birth weights than babies with moms who were not exposed. However, the difference was only about 75 grams (about 2.6 ounces), which is not very likely to be clinically relevant. The study did not find any difference in miscarriage rates between women who took antidepressants and other women. “The overall message for me coming out of the paper, is that there are some potential risks of using antidepressants and women should definitely be made aware of them, but they also need to be made aware of the magnitude of the risk, considering whether a 75-gram difference in birth weight is worth all the difficult things that come with experiencing depression,” says Dr. Ross. Dr. Ross notes that a woman’s best option regarding taking antidepressants while pregnant depends on the individual woman’s needs and her experiences and preferences. She stresses that it’s essential for women who are suffering from serious depression to get help of some form. The form of that help depends on that person’s needs, how severe the depression is and what they are comfortable with. There can be times when the symptoms of depression are more consequential to the health of the mother and baby than the effects of the antidepressant medications. “Our research concludes that antidepressants may be a reasonable option,” says Dr. Ross. She adds that there is good evidence supporting other depression treatments as well, such as certain forms of psychotherapy. However, those treatments may not be accessible to most women. Dr. Ross recommends that any woman suffering from depression while pregnant should talk to her health-care providers about the evidence that is available for her circumstances, and make sure she has access to all possible options before making a decision about taking antidepressants.